1. 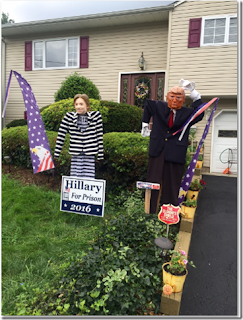 Although the display of the Trump mannequin in my yard dates back to June 2015 you gave preference in your presentations to my neighbor's mannequin of Hillary Clinton that has been on display for only a few weeks – in fact it is moved inside my neighbor's house each night unlike my Trump display that has faced all of the weather elements for over fourteen months. 2. I consented to do the story on the condition that it would not be presented as a feud between neighbors. The title of the video was Dueling Harris Avenue Displays. The video used the words "brother against brother, & neighbor against neighbor." This is no where near the point of view or direction that I thought the article would pursue. 3. The video showed my neighbor's face clearly speaking toward the camera explaining why he installed his mannequin of Hillary while for my part the audio of my voice was faint & my head was cut off from view for most of my time on camera where I explained why I installed the mannequin of Donald Trump over fourteen months ago. 4. The video also presented photos of each candidate for president – introducing Hillary's photo calling her by name & Trump's photo by the words "another view point." 5. The Sunday print edition of your paper showed only my neighbor's mannequin of Hillary & included a large print quote from him concluding "Hillary has more going for her." My mannequin display was not shown in the print edition & there was no quote from me in large print. All in all I feel betrayed & am sorry that I consented to the interview & article other than it provided a vivid example of the danger of the hostile anti American media. Upon receipt of Mr. Mentzel's letter the General Manager (GM) of the newspaper called Mr. Mentzel & in an attempt to placate him offered to make a few corrections & updates to the online version of the print edition of the original article that would be seen by a much smaller audience than the original article. After seeing the updates online Mr. Mentzel called the GM & said the corrections were unsatisfactory & that he would like his above letter published. The GM balked, for obvious reasons, & the call ended without definitive resolution although Mr. Mentzel felt the GM was going to do something more. Below is the updated article that was published this past Sunday (9/18) that set the record straight regarding the favoritism shown in the original article. Mr. Mentzel & I agree this is a better solution than having his letter published because the GM got the point & corrected the article & actually provided more information than was in the letter. Dennis Mentzel is a low key citizen who is not looking for the limelight – he just wants to be left alone – the inalienable fundamental right from which life, liberty & the pursuit of happiness are derived. He actually is a disabled veteran who honors America every chance he gets. This is the first letter to an editor he has ever submitted. He really is like most of us in this regard & accordingly provides an object lesson for us all. He should be congratulated for his perseverance in following up to make sure the accurate story was told. The easier path would have been to just leave the story as originally published. Both the original video & print edition article are the examples that show the danger of media bias that can have a negative controlling effect on our lives, even if ever so subtly – that unfortunately goes on everyday with the hostile anti-American media telling us a slanted version of the news. Dennis's follow up is an example of the effort it takes to make sure that doesn't happen. This post highlights three strikes against Hillary Clinton becoming president – two strikes revealed in the past ten days & the other over the entire time she has been a national figure - summarized as follows: 1) her health is questionable, 2) her contempt for the American people is much greater than just half of Trump's supporters, & 3) her bad judgment & lack of accomplishments show no qualifications to lead the country. During the past several weeks I have received more than my fair share of messages alerting me to just about every unhealthy condition that Hillary Clinton could possibly have –e.g., spot on her tongue, growth in her ear, being steadied by Secret Service men while going up steps (this one was actually in SC in February – she slipped on steps), coughing, etc. I responded privately to these messages with comments like: 1) I tend to not believe the story. If it was true it would be all over the place with scores of reporters watching her every move everyday; 2) I don't put a lot of stock in that report. She is watched like a hawk & most of what is said in the video is spinning some idiosyncrasies into the theory she is not fit; 3) You would have to hear it from a more reliable source than this video before I would believe it; & 4) I tend to not believe she is in terrible health. If it was true it would be all over the place with scores of reporters watching her every move every day. Well, when scores of reporters watched Hillary forced to leave the 9/11 memorial service early @ ground zero last Sunday, & then not under her own power, things changed about whether or not @ least some of the accounts postulated about her poor health were true – i.e., something was wrong with her. Hillary was video taped being stood against a post like a sack of potatoes before she collapsed into a car that took her to her daughter's apartment not far away. Ninety minutes after collapsing Hillary emerged from Chelsea's apartment building & responded when asked how she felt – "I'm feeling great." And then as a distraction to change the subject added "It's a beautiful day in New York." Here is a classical example of the lying that goes on with this woman – she is not fine or feeling fine. She was supposedly diagnosed with pneumonia two days before - if you can believe that after the initial claims of being overheated & dehydrated on a pleasant day. This incident not only questions Hillary's health but also provides an excellent example of why she is not trustworthy – there was no forthrightness in this health issue which follows the pattern of many other issues like her private e-mail server & handling of classified e-mails. This health matter is further complicated because after Hillary left Chelsea's apartment building she called a young girl over for a photo op in which she hugged the girl. Unusual behavior for someone who proclaimed to be affected by a disease-causing organism. Peggy Noonan describes what she calls "the Clinton Scandal Ritual: lie, deny, revise, claim not to remember specifics, stall for time. When it passes, call the story 'old news' full of questions that have already been answered. 'As I've repeatedly said before . . .'" Some of these steps are still being played out in some Clinton scandals. Click here for a version of this health incident that shows some metal pieces falling out of her right pant leg as Hillary is dragged off the curb to her car. Neither the metal pieces or the whereabouts of her husband during this health incident have been properly explained – Bill supposedly was in Chappaqua waiting those three to four hours for Hillary to come home. Believe that one too? Although Hillary was obviously exhausted trying to keep up with the rigors of the presidential campaign we all know her medical history which includes fainting, falling - resulting in a concussion, suffering from double vision & dizziness, & being treated for a blood clot in her head. Hillary still takes the blood thinner Coumadin to prevent blood clots. Now medical records have been released. The problem with medical records is that anyone can find a doctor who will testify to anything for a price. So that leaves us to draw our own conclusions about such documents & our own observations. On Friday September 9, speaking in NYC @ a fund raiser targeting LGBTs, headlined by homosexual icon Barbra Streisand, Hillary said "You know, to be grossly generalistic, you could put half of Trump's supporters into what I call the basket of deplorables. Right? The racist, sexist, homophobic, xenophobic, Islamophobic – you name it. And unfortunately there are people like that. And he has lifted them up." First – there is no such word as "deplorables" – but we all know what & who she meant – namely us. Click here to hear Tucker Carlson explain Hillary's contempt applies to virtually all Americans. Mr. Carlson's video was made in June, over two months before Hillary's deplorable (that is a word) comment. Like Mr. Carlson, look for yourself @ Hillary's body language & voice tone – whether she is telling people in Iowa, Florida, or California that she loves being with them you can see she does not mean it. She is just going through the motions that are hateful to her & her contempt shows clearly to those of us who are even the least bit discerning. Do we want a president who not so secretly harbors such feelings toward the people she hopes to lead? On Hillary's watch as Secretary of State there is a long list of negatives & not one positive that either Hillary or I can think of. See below. First & foremost there was the murder of four Americans in Benghazi, Libya on the night of September 11, 2012 – right in the middle of the home stretch of the 2012 presidential election campaign. Hillary's defense of her inaction follows the steps of the above Clinton Scandal Ritual. On March 6, 2009 Hillary presented Sergei Lavrov, Russian Minister of Foreign Affairs, with a red button with the English word "reset" & a Russian word she thought meant "reset." Mr. Lavrov explained that she used the wrong word which meant "overcharge." They pushed the button anyway & despite her best intentions the relationship with Russia is terrible. In addition, Hillary was a leading proponent for American intervention in Libya under the UN, NATO, & Arab League bypassing the Congress, there was the unraveling of Iraq, constant clashes with Hamid Karzai in Afghanistan, her identifying Bashar Assad as a reformer, her inability to identify Islamic fascists (e.g., Orlando night club), & the poor judgment involving the Clinton Foundation – see first referenced post below for details. Hillary supports the Iran nuclear deal & so does her VP selection. During Hillary's ABC (Anti-American Broadcasting Company) interview with Diane Sawyer in 2014 Sawyer asked the seemingly softball question - What significant things did she accomplish during her four years as Secretary of State? Forbes reported that Hillary didn't even try to answer the question but just changed the subject. 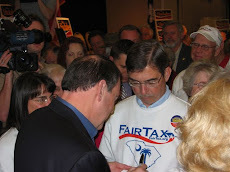 The Washington Post (WP) reported – "When Sawyer asked Clinton to detail a marquee accomplishment or signature doctrine as secretary, she gave no answer — an exchange her Republican critics immediately highlighted." The New York Times (NYT) had previously reported on Hillary's response to the same question – "It was a simple question to someone accustomed to much tougher ones: What was her proudest achievement as secretary of state? But for a moment, Hillary Rodham Clinton, appearing recently before a friendly audience at a women's forum in Manhattan, seemed flustered." But click here to hear for yourself what Hillary listed as her accomplishments when she was Secretary of State. Judge for yourself whether or not the above reports from the WP & NYT were accurate. In summary, Hillary is a person driven way beyond the normal high energy person who succeeds in life. Can you imagine Hillary being a sports fan following a baseball or basketball team? Or someone with a hobby that provides meaningful use of time? Or a person who could find fun & rejuvenation during a family vacation? I can't. Hillary can only find satisfaction, she thinks, by becoming the President of the United States & she will do or say anything to accomplish that goal as described above. Thanks to Congressman Frelinghuysen for reminding us that it was 25 years ago that Ukraine declared independence from the Soviet Union on August 24, 1991. But twenty-five years later Ukraine is still in conflict with its dangerous & menacing next door neighbor – Russia, who has forcibly annexed Crimea & supports rebel forces in a conflict that has already cost 10,000 lives with another 22,000 people injured. "In recent weeks, 40,000 Russian troops have deployed to the Ukraine-Russia border region. The ultimate purpose of Russia's escalation is not yet evident, but it is clear that Vladimir Putin refuses to accept a thriving pro-Western democracy in Ukraine. As Kiev works to overcome these threats & enact reforms, the United States must step up its support to our beleaguered partner. "In 1991, the Ukrainian people clearly declared that they wanted to chart their own destiny. More than ever before, the United States should help Ukraine fulfill the promise of the past quarter-century & enable the country to choose its own role in the international community." Long time readers of RTE know of my affinity for the libertarian Ukrainians who fought behind the barricades in the Maidan in 2013 to preserve & protect their freedom much like our Founding Fathers fought for freedom in America over 200 years before. RTE's readership in Ukraine rarely drops lower than second in worldwide blog readership. Russia & Moldova are often near the top. I believe it could very well be the same people reading these messages as they move from country to country. But what I do know is that the people who live under the conditions recounted by Congressman Frelinghuysen above are best described by Alexis de Tocqueville: "I should have loved freedom, I believe, @ all times, but in the time in which we live I am ready to worship it." The quality of a source of information is easily obtained when you personally know something about the subject matter of an article (like architecture or gardening) or were the subject of an article yourself (like the following account). The case in point pertains to a newspaper article concerning the display of mannequins of Donald Trump & Hillary Clinton shown on the above photo. The owner of the house in the photo (Dennis Mentzel) is a bedrock solid Trump supporter who built & clothed both mannequins & placed them on his property as an expression of his political beliefs regarding the 2016 presidential election. The mannequin of Trump was placed in the front yard from the outset of Trump's announced presidential candidacy in June 2015 as a statement of support for Trump. The mannequin of Hillary was recently put in place as more & more evidence of pay to play corruption was revealed concerning foreign government donations to the Clinton Foundation while Hillary was secretary of state. In addition, e-mails from Hillary's private server were not only deleted, like a normal person would delete e-mails, but were destroyed beyond recognition using the software BleachBit. 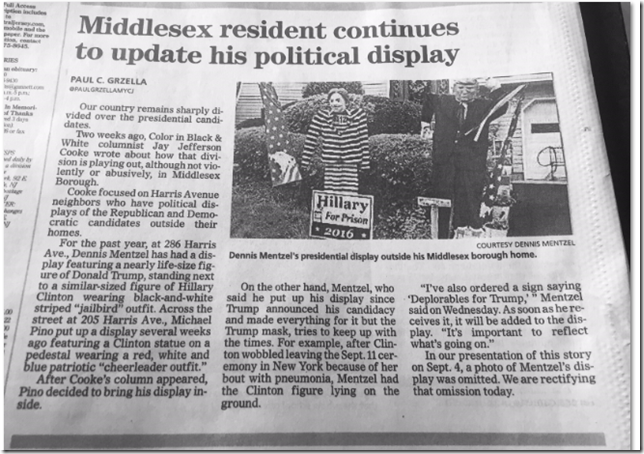 A NJ newspaper, whose distribution geographically covers about one quarter of the state, offered to do a story on the mannequin display but wanted to include a display of a Hillary mannequin that was put in place just a few weeks ago on a neighbor's yard across the street from the one shown on the above photo. Mr. Mentzel agreed to the running of the article but insisted that it not be presented as a feud between neighbors. The first breach of trust by the newspaper was the title of the article on a video that was shot for the online edition of the paper – Dueling Harris Avenue Displays, with the subtitle - Neighbors have displays of presidential candidates. The video used the words "brother against brother, & neighbor against neighbor." The biasness of the article continued from there. The video showed the neighbor's face clearly as he looked directly toward the camera & presented, with clear audio, the reason why he installed his mannequin of Hillary. 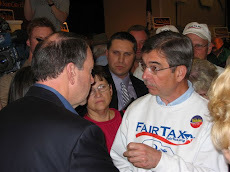 Although Mr. Mentzel did state his reason of why he supported Trump, the audio was faint & most of the few seconds Mr. Mentzel was seen on the video his head was @ least partially cut off from view. The video also presented photos of each candidate for president – introducing Hillary's photo calling her by name & Trump's photo by the words "another point of view." On Sunday the paper ran a print edition of the story that continued the same biased theme described above showing only the neighbor's mannequin of Hillary with a quote from the neighbor in large print concluding that "Hillary has more going for her." Mr. Mentzel's mannequin display was not shown & there was no quote from him in large print. The media's hostile anti-American agenda is seen in the above example that shows, in some ways subtly, why we should beware of the information we take from them. This applies not only to national papers like the NY Times or Washington Post but small local papers as in this case. That is why from time to time I repeat the advice from Neal Boortz's radio program & message from his blog - "Don't believe anything you read on this web page or, for that matter, anything you hear on The Neal Boortz Show unless it is consistent with what you already know to be true, or unless you have taken the time to research the matter to prove its accuracy to your own satisfaction." This is this same common sense standard I always encourage readers of RTE to use – questioning & commenting are how we all learn & I thank everyone who participates & contributes to this blog. Full disclosure – I am a friend of Dennis Mentzel & a supporter of Donald Trump for president.